Festival season is about to kick off and while wellies and wet wipes are flying off the shelves, brands are adding the finishing touches to corporate sponsorship, sales promotions and experiential marketing activities. Festivals have become synonymous with brands over the past five years or so. Set on captivating the more technologically savvy, informed and trendy Generation Y, festivals present a unique opportunity to engage with this audience. But with many brands playing a similar game and sharing a strong desire to be present, many miss the point of engagement and turn their presence into nothing more than a badging exercise which doesn’t bode well for festival-goers. On a commercial level it also begs the question as to whether the investment is really worth it? Festival commercialism has always been a touchy subject for music lovers. Set on the view that festivals should be all about the music, cynicism has often arisen around disconnected brand alignments and perceived fake sentiment which can leave a sour taste in consumers’ mouths. Finding a balance is important as brand overkill without a clear purpose, value or audience benefit just isn’t going to fit the bill. This is where I think technology brands have a unique advantage due to their potential to connect on a more emotional level with an audience compared to the average drinks brand, for instance, and provide greater value through a more integrated experience. 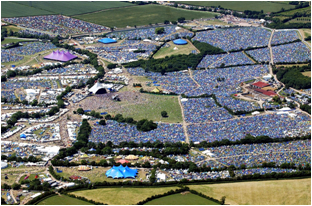 Orange, for example, has constantly built on its Chill ‘n’ Charge tent idea at Glastonbury ever since its launch in 2002. Each year it has given its constantly connected audience the power to stay in touch with friends by providing free mobile phone charging facilities, downloadable apps to locate your friends and tent and free broadband services to enable users to upload and share photos online. This year it has boosted its green credentials, another issue close to the hearts of Generation Y, through the launch its eco-friendly mobile phone charging prototype – Orange Power Wellies. The brand has also continued to build on its music credentials outside festival season through its Orange Rock Corps initiative. To avoid homogenisation and potential negative sentiment, brands need to think more creatively about audience engagement and steer away from strategies of brash visibility and quick wins. To make the most of the investment they should consider the potential of creating more long-term relationships with audiences and find new ways of connecting on another level which strikes an emotional cord too. N.B. Although Orange is a client of Edelman, we do not work on the Chill ‘n’ Charge project mentioned above.